We were all wonderstruck on entering the hall of the Sporting in Monaco on Friday, August 1, 2014, where the fashionably dressed ladies and tuxedo gentlemen were given the White Carpet Treatment with a large and bright red cross signaling the way to the high-profile and mythical Ball of the year, with mirrors and screens everywhere adding to the allure of the evening. A sculpture of a red cross entitled “Gaia” created by artist Mateo Mornar was flanking the entrance, and had been inspired by the love and altruism of the Monegasque Red Cross association, in their quest for bringing hope to those in need. Photographers from all over the world were lined up, waiting with high anticipation for the arrival of Prince Albert and Princess Charlene, plus a cohort of celebrities and distinguished personalities from Monaco and abroad. In gaining access to the Salle des Etoiles, the privileged guests were welcomed by the lively music from the Zhang Zhang Band, to discover the walls of the Salle des Etoiles (Salon of the Stars) also covered in pure white with decoration of red roses. Zhang Zhang, violinist with the Philharmonic Orchestra of Monte-Carlo, created the Zhang Zhang Band in 2002 with jazz guitarist Leopoldo Giannola. Their musical repertoire includes a mix of classic, jazz, swing, flamenco, bossa nova and tzigane, and they play regularly at charity events. Every guest was a star when posing for the traditional photo op at the top of the stairs, before being guided to their respective table. It was a surprise to find that mirrors had replaced the linen tablecloth magnifying the scintillating effect and reflecting the beautiful centerpieces made of roses and geraniums. It was certainly the place to be and be seen for the 850 guests who visited each other at their table in a convivial atmosphere, but the buzzing and chattering stopped and everybody stood up for the arrival of the Prince and Princess to inaugurate the 66th edition of the glamorous Red Cross Ball that Prince Albert presides. The sovereign looked really smart in a white dinner jacket and black bow tie, holding tenderly the hand of a radiant and confident Prince Charlene, dressed in a Dior floor length maternity gown in midnight blue silk taffeta with draped black back ending in a train, with a pair of silver Dior pumps and a new diamond flower garland and diamond drop earrings. 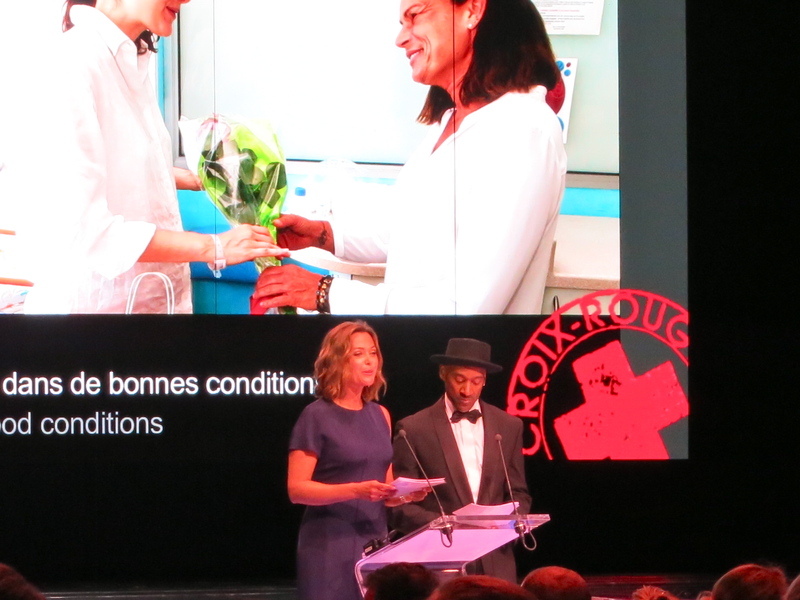 The well-known French TV presenter Sandrine Quetier dressed by Akris hosted the evening for this special occasion, accompanied by no other than Marcus Miller, Unesco artist for peace and spokesperson for the Slave Route Project. They animated the tombola that included six prestigious lots: a jewel by Cartier, a trip and stay in Los Angeles to participate in the Princess Grace Foundation Gala donated by Credit Suisse of Monaco, a Chopard watch in pink gold and diamonds donated by the International German Club, a Rolex watch submarine donated by Alexander Ruebben, a jewel in the form of a cross in pink and rubies from Zegg & Cerlati and an evening gown offered by Akris. Guests had been given a number included in their menu. Prince Louis II of Monaco founded the Monegasque Red Cross in 1948, and it was the year of the first Gala in Monaco chaired by the young Prince Rainier III. It was in 1982 that Prince Albert took over as President of the association after his mother Princess Grace passed away. The proceeds from their annual Ball make it possible for the association to finance its projects at the local level and around the world. After the tombola a delicious three-course dinner was served that guests supplemented with champagne and excellent wines. Then it was the turn to the South African group Freshlyground perform, and as it is the tradition the Prince and Princess opened the Ball, joined soon after by the buoyant guests in their beautiful attires. Freshlyground is a South African Afrofusion band that formed in Cape Town in 2002, with members from South Africa, Mozambique and Zimbabwe. They played a diversity of songs including those in their fifth studio album Take Me to The Dance. They received the MTV Europe Music Awards for Best African Act. The highlight of the evening was the performance by Canadian jazz pianist and singer Diana Krall known for her contralto vocals, who delighted the audience. She is one of the best-selling artists of her time, having sold more than 6 million albums in the US and over 15 million worldwide. To date, she has won two Grammy Awards and eight Juno Awards, and has earned nine gold, three platinum and seven multi-platinum albums. She married to British musician Elvis Costello in 2003 at Elton John’s estate outside London and they have twin sons. Her latest album Glad Rag Doll was released in October 2012. The lights went off in the Salle des Etoiles to the sound of fireworks that illuminated the sky, signaling the end of an enchanting evening. When leaving guests searched through the photos exposed, another way to help raise funds for the association, a souvenir of a truly memorable event for a great cause!